"Indian-style tangy fish curry. This is famous Chepala Pulusu from Andhra." Place fish in a bowl; add 1 tablespoon vegetable oil, 1 tablespoon chile powder, turmeric, and 1 1/2 teaspoons salt and allow to marinate for about 10 minutes. Place tamarind pulp in a bowl and pour warm water over it. Squeeze tamarind to extract juice. Heat 1/4 cup oil in a skillet over medium heat; add cumin seeds and stir. Add onion to cumin; cook and stir until onion is translucent, 5 to 10 minutes. Add garlic paste and cook for 3 minutes. Add carp, cover the skillet, and cook for 5 minutes. Mix tamarind juice into fish mixture; bring to a boil. 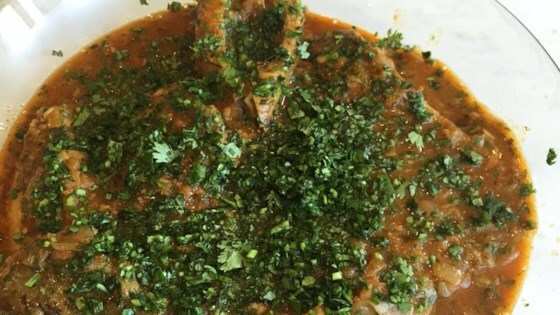 Turn carp pieces; add 2 tablespoons red chile powder, coriander, and salt. Cook over low heat until sauce thickens and oil separates, about 10 minutes. Garnish with coriander leaves. Tasty white fish fillets are baked in a spicy curry sauce. Tilapia can be substituted for carp, if desired.